Is the MacBook Pro 13-inch Beneficial for a Graphic Designer? – ACC Interactive Media Arts Student Blog! Is the MacBook Pro 13-inch Beneficial for a Graphic Designer? Apple it is considered one of the big four popular companies for technology that fits the needs of their followers. 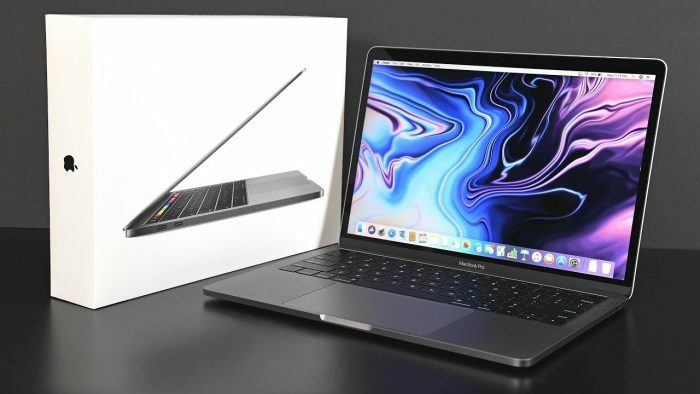 In this blog I will be share my personal experience with pros and cons that I have experience with the MacBook Pro touch bar 13-inch 2018 as a graphic designers. The pros that I found in the MacBook Pro are based in the quality of the hardware that runs fast. I’m always looking for the speed that a laptop can provides me, with more RAM the better speed that a laptop can work with many programs at the same time. The MacBook provides me with the capability of 2,519 MB/s SSD which is a great speed that runs the heavy applications of Adobe like Photoshop, Illustrator, Indesign etc. The size of the laptop it is very accessible, as I need to be carrying it around, it’s not heavy and their size is not that big (13-inch). On the other hand, the i5 processor has worked for me good as a graphic designer. I don’t consider that having the i9 could be really important because my laptop has run fast and efficiently but I do consider the i7 to i9 processor would be better for video editing because I could run more programs at the same time. With the intel iris plus graphics 650 screen colour I am amazed; in my personal experience with the colours the laptop is showing 95% exact of what I expect when i’m printing. However, the MacBook Pro has the problem that it does not include the legacy ports (USB, Ethernet, SD Card) in with I consider really important at the time to connect the USB cord of a hard drive, but otherwise I do consider the MacBook Pro 13-inch a very qualify laptop for graphic designers. This entry was posted in IMA Interactive, Interactive Design & Development, Interactive Technologies and tagged apple, Benefits, Graphic Designer, MacBook Pro. Thank you for describing both positives and negatives! It seems like the pros outweigh the cons and that’s why you recommend it, but it would be nice to see how other laptops compare in terms of speed and features for next time. I’m interested in getting a laptop eventually so I’ll definitely consider this one now. Interesting comment on colour matching the printed works, I wonder if that depends on the printer as well? Either way good to know the screen colour is higher quality than many other computers. Also interesting that you mentioned it wasn’t very heavy, as this is a huge problem I have with certain laptops, they’re too annoying to carry around all day! Great blog post! As someone who is considering making the jump to Apple, this was really informative to me. I liked how you compared various processors and even stated that the i7 or i9 would be better for video editing, you are well informed on the subject. Also to be totally honest I never take into consideration how the screen will look, which is important in graphic design! I agree that not having any of the legacy ports is a heavy price to pay, we all know how well the cloud works sometimes. I would love to know more about maybe a different MacBook that would be somewhat comparable to the MacBook Pro.